Ben Bernanke wants prices to rise 2%. There are numerous problems with such a proposal, the first being increases in money supply sometimes lead to asset bubbles and not increases in prices of consumer goods. Indeed the Fed completely ignored (if not encouraged) the housing bubble because home prices are not in the CPI. A housing bubble and a housing crash was the result. 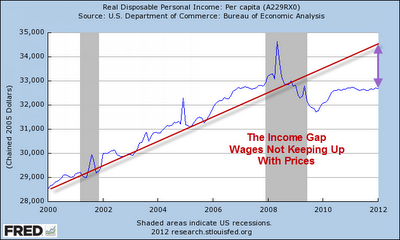 The second major problem with inflation targeting is prices may go up, but wages may not necessarily follow. Indeed they haven't. 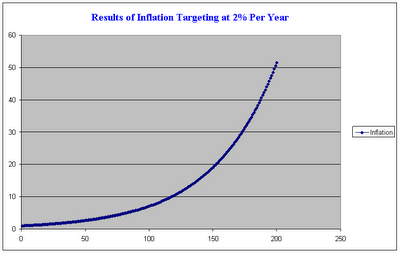 Let's start with a graph of 2% price inflation over time. That chart nicely shows a slight parabolic pattern similar to the start of the first chart. However, that growth is a mirage based on population changes. Let's factor out population increases. That "Income Gap" is not the only problem. One must also consider "skew". 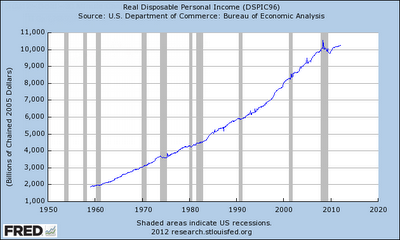 As a result of Fed policies, there have been some income gains, but only at the top end. "Per Capita", by definition, averages out those gains. In reality, a select few percent have done exceptionally well as a result of Bernanke's tremendously misguided policies. Another few percent have simply done well, and another perhaps slightly larger group have barely kept up. 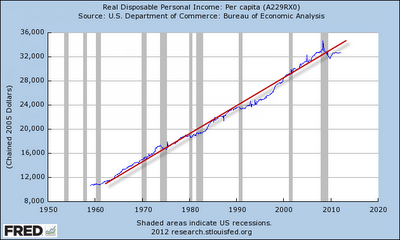 The bottom 80 percent or so have fallen much further behind than the per capita charts suggest. Except for the banks, brokers and bondholders, and everyone else bailed out by the Fed, most have been clobbered by Fed policies. Ironically, many of those bailed out have the unmitigated gall to whine about their plight. Please See Unbelievable Stress of Making "Only" $200,000 After Taxes for details.